Sports worlds were colliding in the name of charity again on Thursday night as Dominic Moore hosted his 3rd annual ‘Smashfest’ ping-pong event in downtown Toronto. For the third year in a row, Moore hosted current and former NHL players as they squared off and tested their ping-pong skills in support of two worthy causes – concussion research and advancing the knowledge and science around the study of rare cancers – both causes which Moore is extremely passionate about. 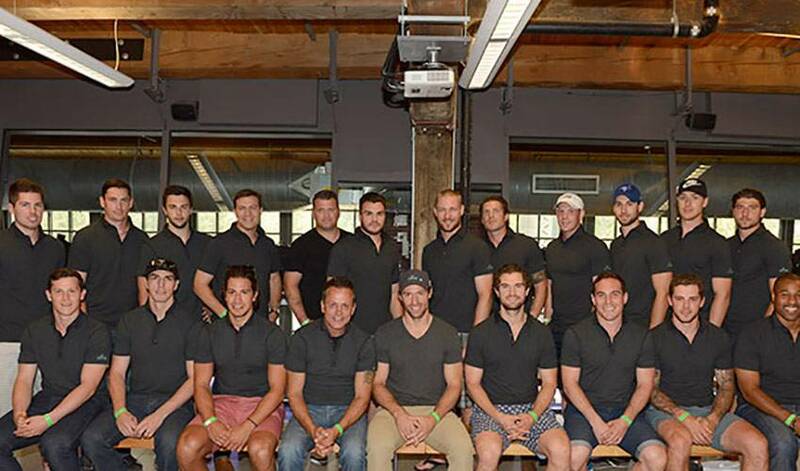 Along with Moore, the creator and host of the event, the 2014 edition of Smashfest featured a significant group of players, both past and present, including Derick Brassard, Alex Burrows, Mike Cammalleri, David Clarkson, Logan Couture, Michael Del Zotto, T.J. Galiardi, Doug Gilmour, Mike Johnson, Kevin Klein, Nick Kypreos, Shawn Matthias, Jamie McLennan, Jeff O’Neill, Teddy Purcell, Zac Rinaldo, Tyler Seguin, Jeff Skinner, Cam Talbot, Chris Tanev, Stephane Veilleux and Kevin Weekes. Ping-pong is a popular past-time in NHL dressing rooms and this experience and skill was certainly on display as the players brought their competitive drive and spirit from the ice to the tables. The competition also saw some lucky fans get involved, testing out their basement and bar-room ping-pong skills against the seasoned NHL veterans. TSN Radio 1050 tennis analyst, Ken Crosina was once again on-hand to act as the MC for the festivities, providing some insightful commentary and helping to keep the tournament moving along. After an impressive doubles tournament that saw Smashfest guests teamed up with NHL players, the focus turned to the main event, as the singles competition pitted NHLPA members against each other. Stephane Veilleux once again emerged as the Smashfest champion, as he defeated Alex Burrows in a spirited and entertaining final match. "We had an amazing time at Smashfest again this year,” said Dominic Moore, New York Rangers forward and Smashfest host. “The support we received was impressive on all fronts, from the players and guests in attendance, to the NHLPA and all of our partners. I'm proud that over $140,000 was raised to further help with research into concussions and rare cancers." Along with the music, socializing and ping-pong action, those in attendance had a chance to bid on live and silent auction items. Over 650 people attended the sold-out event, cementing it as one of the top events in Toronto in the summer. When paddles were put down and the the ping-pong dust settled, the money raised all goes towards the The Katie Moore Foundation, which was established in honour of Dominic’s late wife, Katie, and the Steve Moore Foundation. Players and fans in attendance were active on sharing their experiences on social media. Amazing time spent with wonderful people at #Smashfest last night! Thank you @mooredom @NHLPA it was a first class event for great causes!